The Redditor preferred to ditch the marriage advice in favour of his best Nintendo hack. It's wedding season, which for a lot of us means hundreds of pounds spent on hen and stag dos, splashing out on wedding gifts and hotel stays and trying to figure out what to write in those pesky guest books. But when one Reddit user by the name of Doc Pop, was asked to sign an "advice book" at a wedding, he decided to go for an alternative approach and not actually offer any marriage advice at all. 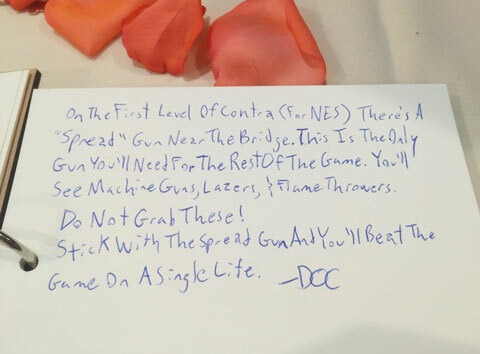 Yep, instead of offering any marriage or relationship advice, Doc decided to stick to what he knows by giving him some crucial tips on the vintage Ninetendo game, Contra, instead. To be fair, we have almost no idea what he's going on about here, but it technically is advice. You probably just have to be the right couple to actually find it useful.